The Royal County Down Ladies star won her third successive Irish Girls Open strokeplay at Roganstown last weekend and she is clearly relishing the chance of challenging for another win at Royal Troon on Sunday. High winds made life tough for the 105-strong field with the cut for the top 60 and ties falling at 14 over par 158. That meant an early exit for Shannon Burke (161), Maura Diamond (168) and Victoria Craig (168) with eight Irish surviving to play Sunday’s final round over the Old Course at Royal Troon. Castletroy’s Chloe Ryan (73-76 149) is tied for 10th with Lurgan pair Annabel Wilson (73-78 151) and Niamh McSherry (73-78 151) tied for 20th. Lisburn’s Paula Grant (76-76 152) is 25th on eight over with The Heath’s Mary Doyle (76-77 153) and Lahinch’s Sinead Sexton (73-80 153) joint 32nd. 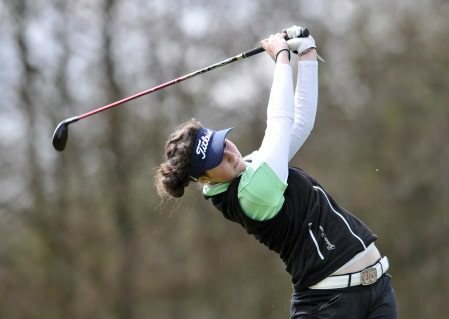 Olivia Mehaffey flew the flag for Irish golf as world No 3 Linnea Strom fired a four under 68 on Troon Portland to share the first round lead in the Helen Holm Scottish Strokeplay.